Porsche is one of the world’s most recognised luxury sports cars. Throughout the decades there are many movies that Porsche makes an appearance, from romantic to action-packed or car chase scenes. These cameos have embedded Porsche as an icon across the globe known for its speed, quality and style. The history of Porsche cars are famed in some of Hollywood most notable films. Top Gun featured a stunning black 356 Speedster Porsche 1956 model. When this movie came out in the 1980’s it blew audiences away showing one of the coolest cars driven by Charlie the leading lady in a young cast of adrenaline-pumping film starring Tom Crusie , Val Kilmer, Kelly McGillis and Meg Ryan. The movie was about the top gun Naval fighter military school, where America’s elite fighter pilots train. Bad Boys in the opening number of the movie a Porsche 911 Turbo, 1994 model makes its first appearance. Bad Boys definitely was one of the top blockbuster action movies from the 90’s. In the movie the leading actor Will Smith Will Smith plays a stylish, very cool, charming character Micke Lowrey he is a detective cop and owns a sleek black Porsche. 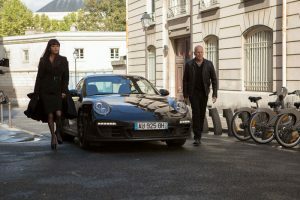 The moment in the movie were the Porsche could show of its power and speed was in the final drag race. No doubt by far the history of Porsche in movies must include a shiny Cherry Red Porsche 944, played a major part in winning the hearts of coming of age movie Sixteen Candles released in 1983. The character Jake Ryan is the most popular guy on campus he drives around in the latest sports car determined to find ways deserving of the average girl in school. The iconic part of the movie is when the stunning 944 is parked in front of a church while Jake waits for his girl.